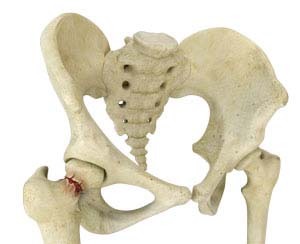 A hip fracture involves a break that occurs near the hip in the upper part of the femur or thigh bone. The thigh bone has two bony processes on the upper part - the greater and lesser trochanters. The lesser trochanter projects from the base of the femoral neck on the back of the thigh bone. Hip fractures can occur either due to a break in the femoral neck, in the area between the greater and lesser trochanter or below the lesser trochanter.